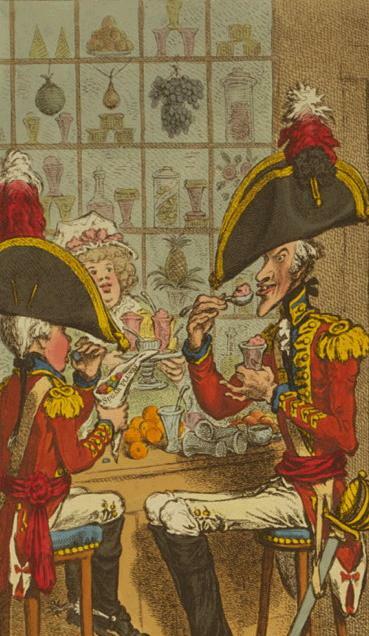 “Folkstone Strawberries or more carraway comfits for Mary Ann,” showing Samuel William Fores’s at the corner of Sackville Street and Piccadilly, c.1810, attrib. Isaac and George Cruikshank. Via Wikimedia Commons. One or two parties divert attention while another “stars.” This is either done by a diamond, or by inserting a small pen-knife through the putty near the corner of a pane and cracking it; the wet finger carries the crack in any direction; an angle is generally formed. The piece is wrought to and fro, and removed; if necessary, another piece is starred, to allow of the free ingress of the hand. Small panes also presumably meant it would take a lot more effort and time for thieves to access everything in the store window—and provided a convenient way to display more small wares, because as you can see in the above engraving, they built the windows with lots of tiny shelves to display items in every pane! 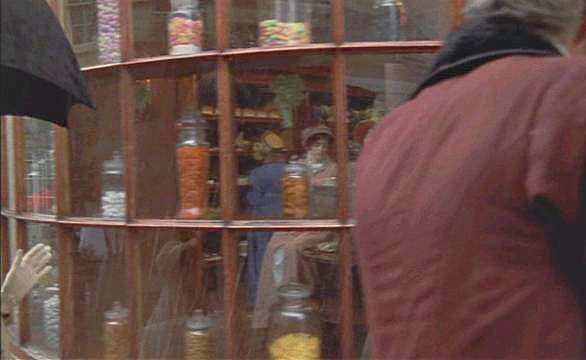 Here’s a still of a sweet shop in Bath from the 1995 Persuasion, from this excellent blog post at Jane Austen’s World. I looked at their screencaps a lot while creating the Honey Moon confectionary in my Lively St. Lemeston series. A printseller. Crowds looking at the prints in printsellers’ windows seem to be a popular caricuture topic because I found LOTS of them. 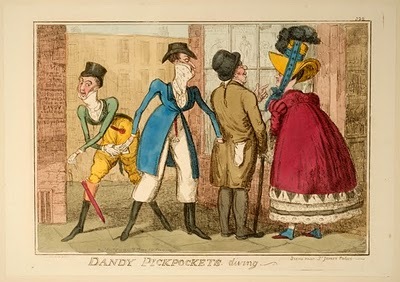 I especially love these dandies picking pockets from this wonderful post on dandy caricatures. This tavern in colonial America has ivy leaves in the window for Christmas! “Night,” from the Hogarth series “Four Times of the Day,” 1736. Via Wikimedia Commons. The dentist/barbershop to the right of this Hogarth painting has a candle in every window pane, probably because at night the windows would reflect and amplify the light back into the room, serving as sconces. And here is one of my very favorite things in the Metropolitan Museum, an actual 1775-7 fancy Parisian storefront, carved from oak and stunningly beautiful. What cool pictures! 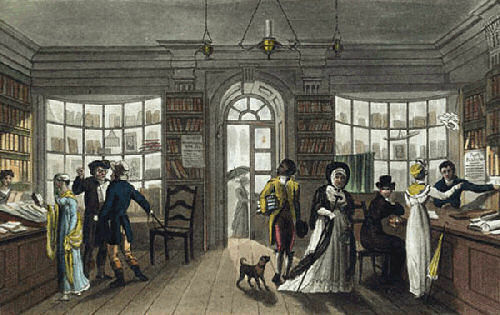 I particularly like that last Hogarth. Very atmospheric. I live in suburban mall-landia, which is often sadly short on character when it comes to storefronts, but tucked away in the near-deserted downtown of the city where I live is a row of late 19th/early 20th (as old as you get, in this area) century buildings, which currently house a used bookstore (LOVE that place), a florist, a consignment shop, and a home décor boutique. They look so cool with those smaller panes of glass. Isn’t that Hogarth cool? Although it just upsets me when I think about my dentist being a barber. So glad I live now and not then! I know what you mean. 🙂 I have to push aside my knowledge of science and medicine to enjoy the Regency. Dental care, diseases, food safety, gah! If I inadvertently time-traveled there, I’d be a nervous wreck. I do love Hogarth. The people at the aforementioned used bookstore know what a nut I am for picture books that feature 18th and 19th century artists and fashions. They’ve snagged some neat finds for me. No Hogarth yet, but it could happen!